This set of Biochemistry Multiple Choice Questions & Answers (MCQs) focuses on “Biochemistry Tricky Questions and Answers”. 1. Which of the following is a hypertonic solution? Explanation: The sea water or oceans are hypertonic to the extracellular fluid of many of the marine organisms. These marine organisms overcome the problem of hyper tonicity by expelling the salt water continuously. pH = 2 – log2 = 1.7. Explanation: It is a neutral solution and its pH = 7. 4. What does it mean when we say that water acts as a “heat buffer”? a) It keeps the temperature of an organism relatively constant as the temperature of the surroundings fluctuates. Explanation: Water has a high specific heat capacity, it is hard to increase or decrease the water temperature which requires a lot of heat energy and therefore water acts as a heat buffer. 5. What trend does the reactivity of group II elements follow with water? Explanation: As we descend down the group, losing of electrons from the outer orbit of an atom becomes easy. 6. Which of the following is not the classified form of conjugated proteins? Explanation: On the basis of the chemical nature of their prosthetic groups conjugated proteins are classified into lipoproteins, glycoproteins and metalloproteins. Explanation: Ionic interactions, hydrogen and disulfide linkages stabilizes tertiary structure of a protein. 8. Which of the following is true? Explanation: The disulfide bridge formed by oxidation of the sulfhydryl groups on cysteine stabilizes protein tertiary structure, allowing different parts of the protein chain to be held together covalently. Explanation: Globular proteins have tertiary structure with hydrophobic amino acid residues and a surface region of hydrophilic residues; these hydrophobic interactions are responsible for the folding and shaping of 3° structure of proteins. 10. Which of the following does not affect the stability of a α-helix? Explanation: The occurrence of Proline and Glycine residues affect the stability of a α-helix. 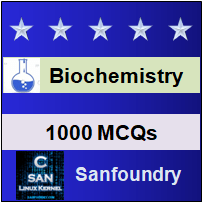 To practice tricky questions and answers on all areas of Biochemistry, here is complete set of 1000+ Multiple Choice Questions and Answers.